Specialized washers are used in plumbing and other applications and can be used to lock nuts in place, electrically isolate mounting screws, limit torque, and more. Once you have a good idea of the type of washer you need, you then have to think about the material it is made out of. It’s fairly common to see washers of all types made out of metal, but it isn’t your only material choice. You can also choose a plastic washer. But, with so many choices, it’s easy to feel overwhelmed and consider skipping the washers altogether. Before we get into the benefits and uses of plastic washers, it’s important to understand why you even need a washer in the first place. No matter what kind of material or washer type you choose, washers have two primary benefits. First, they can distribute the pressure of the nut evenly over the surface of an object, preventing that object from getting damaged by the nut. Second, a washer ensures a smooth base for the nut to press against. This reduces the chance that it will loosen over time because it is in direct contact with an uneven surface. As mentioned earlier, you can find washers that offer some other benefits in addition to these as well. 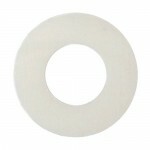 For example, a tab washer can prevent rotation of the washer, in addition to providing the nut with a smooth, even surface. If you realize your application could really use the benefits of a washer, you may next be wondering why you would ever want to choose a plastic one. Isn’t metal always better if you’re looking for strength? It is likely true that a metal washer is the best choice if strength is your number one priority, but not all applications require strength. They may require different features instead. Another benefit is the fact that plastic is more cost-effective than metal. You should never compromise the integrity of your project in order to save a little money, but if plastic fasteners can do the job just as well as metal, you’ll be able to save on the final cost of your project. 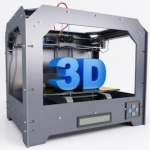 Of course, the type of plastic material you choose matters, too. Your choices aren’t done yet. Once you’ve decided what kind of washer you need, and you’ve decided to choose plastic over metal, you now have to decide what kind of plastic to choose. 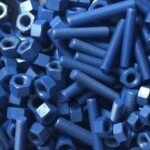 Nylon is one of the most popular plastics used to make a wide variety of fasteners and hardware. It is often used to make washers too because it is strong and wear-resistant. It is able to come in contact with many different kinds of chemicals and materials without causing any kind of reaction. Polyethylene is sometimes used to make plastic washers. 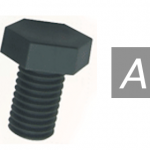 It remains flexible at low temperatures and it is very corrosion resistant, making it a good choice if you plan on using metal nuts or bolts. PTFE is a good choice if instead your application deals with high temperatures. It can handle up to 400 degrees Fahrenheit and has thermal and insulation properties that other plastics can’t match. Because plastic washers are so versatile, they can be used effectively in a wide variety of industries. Various manufacturers often turn to plastic washers when building their equipment. 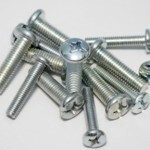 Not only can they ensure that screws and nuts don’t work loose, they are vibration resistant and do not create sparks. This creates a safer work environment, but it also ensures that production isn’t slowed down or stopped for frequent repairs or maintenance. Although strength is important in the automotive industry, so is chemical resistance. Plastic washers are often used because they are vibration resistant, but also because materials like nylon can withstand exposure to chemicals, acids, and other corrosive materials without degrading. Plastic washers and nylon screws are also found in the construction industry. They are especially effective when it comes to electrical applications. That’s because they can withstand high electrical volts without being compromised. They are non-sparking, stable, and they are anti-magnetic, which is important when it comes to electricity. Plastic washers can also be found in the construction of compressors, in material handling, and petrochemical projects. Plastic washers can definitely enhance your application, but because you have so many choices, it’s extremely important that you seek professional advice before you make a purchase. At E&T Fasteners, we are experts at understanding the benefits and drawbacks of fasteners and components that are made out of a wide variety of materials. Simply speak to one of our knowledgeable representatives and we can help you find the right plastic washers for your project.